There are many organizations working hard to support youth and families in our communities and beyond. Here are some resources we find helpful. Let us know if you don't find what you're looking for here. ​Every two years, CVSD works with the Vermont Department of Health to participate in the Centers for Disease Control’s Youth Risk Behavior survey designed to measure the prevalence of specific behaviors that contribute directly to the health of our youth. In March of 2017, 899 CVSD 6th through 8th graders and 1,258 CVSD 9th through 12th graders completed the YRBS. The collected data is used to monitor the safety and well-being of our young people, identify successes and gaps in service delivery for students and evaluate existing programs. Want to know more? Click the image below to see the complete CVSD 2017 YRBS executive summary. This time of year alcohol is often a regular part of the holiday celebration and traditions for some families – office parties, eggnog, and champagne toasts can help to create confusing messages for kids about healthy responsible use. During the teen years, the part of the brain responsible for making complex judgments is not as mature as the parts dedicated to emotion and motivation. So it’s only natural for emotions and impulses to win out over good judgment. At the same time, the incredible changes that take place in the brain during these years leave it very vulnerable to the effects of alcohol and drugs—meaning that the decisions your teen makes now could impact them for life. We know that parental alcohol use and parents' attitudes toward drinking are one of the strongest influences on decisions children will make and the perceptions they have regarding alcohol. Adolescents are less likely to drink if they live in homes where parents have specific rules against drinking underage and also drink responsibly themselves. Always make sure celebrations include a variety of nonalcoholic drinks—water, juices, sparkling sodas - and healthy foods and snacks. It helps give the message that alcohol is not the central component of festivities. AND nonalcoholic drinks and snacks help counteract the dehydrating effects of alcohol and slow the absorption of alcohol in the body to keep partygoers safer. Anyone getting behind the wheel of a car should not have had alcohol. Help your guests get home safely—use designated drivers and taxis. The adolescent brain has a much harder time understanding nuance and it is much clearer to them to understand the message that when you drink, you do not drive. f you choose to drink, model responsible consumption. For men, it takes about an hour for a standard drink to be metabolized in the body. For women it can take longer. Do not provide alcohol to anyone under 21. Marijuana is the most widely used illicit drug among youth today and is more potent than ever. The chances of Vermont kids encountering marijuana in their tweens and teens have increased. During the teen and young adult years, children are especially susceptible to the negative effects of any drug use, including marijuana. And it is clear that the link between marijuana use and mental health extends beyond anxiety and depression. Evidence has shown that marijuana use during the teen years could potentially lower a person’s IQ and interfere with other aspects of academic success and mental and physical well-being. This post will focus on what we’ve learned from research about the connection between marijuana use and mental health issues. Since 2002, a series of ten long-term epidemiological studies have reported that individuals who used cannabis had a greater risk of developing psychotic symptoms and full-blown schizophrenia than non-users. A comprehensive 2007 review of all published papers concerning psychosis and schizophrenia, conducted by a world-wide group of researchers, merged the study data and found that marijuana use almost doubled the risk for schizophrenia. Almost all of the studies involved low potency marijuana common before 2004. A more recent study showed that the risk goes up to 5-fold if the use is heavy or the marijuana is strong (potency 12% THC or higher). The average potency nationwide is now 13%; in Seattle it is 21%. The research is showing that teenage marijuana users have up to a seven-fold increase in the likelihood of suicide planning and attempts. Our own Vermont Youth Risk Behavior Survey data shows that suicide planning and attempts by Vermont teens increase directly as marijuana use goes up. A recent study of Iraq/Afghanistan-era veterans who use marijuana regularly are more than twice as likely to attempt suicide as those who don't use marijuana. Several US states, most recently including Vermont, have approved medical use of marijuana to relieve symptoms of PTSD. However, have been no controlled studies that provide evidence that marijuana is an effective treatment for PTSD. In fact, research suggests that marijuana use can be harmful to individuals with PTSD. In a 20-year study involving over 2000 U.S. veterans being treated for PTSD, those who used medical marijuana in conjunction with the standard therapy reported worse outcomes four months after treatment ended than those who didn’t use marijuana. Vets who started using marijuana during or after treatment had the worst outcomes, while vets who stopped using during treatment showed the most improvement. The heaviest marijuana users showed the most severe effects. The same study found that the veterans who used marijuana reported more violent behaviors, and the group who started use during the course of their treatment reported the most violent behaviors. We know that there are a lot of factors that influence the relationship between marijuana use and mental health issues - the amount of drug used, the age at first use, and genetic vulnerability all have impacts. The strongest evidence to date shows that people with a preexisting genetic or other vulnerability (such as a family history of depression) are more likely to be impacted when they use marijuana. We still have a lot to learn about how the highly potent marijuana available today impacts the brain, but we can say with certainty that those with a family history of addiction or mental health issues are at greater risk. Prescription medicine is a critical part of our cultural fabric and it sometimes seems as if there is “a pill for every ill.” The fact is we live in a society where the potential for prescription drug abuse and addiction is ever present. Among teens and young adults, next to marijuana, Rx drugs are the most commonly abused substances. Young people are abusing pain relievers, depressants and stimulants to go to sleep, wake up, study, stay alert and/or get high. Every day, 2000 kids get high for the first time on a prescription drug (DEA). Drug overdoses have now surpassed car crashes as the leading cause of accidental death in the U.S. (CDC). Many teens and young adults still believe that Rx medications are safer to use than illegal drugs, and sadly these medications prove all too easy to get and are as addictive and dangerous as illicit drugs. Talking regularly to youth about the dangers of alcohol, tobacco and other drugs reduces their risk of using in the first place. SHATTER THE MYTHS – WITH THE FACTS! Research shows parents are still the #1 influence on teens’ decision making. Vermont parents know we should talk with our kids about alcohol and drugs early and often. But how do we get started!?! According to the 2015 Vermont Youth Behavior Risk Survey, 30% of teens in Vermont reported drinking alcohol in the past 30 days, and 16% reported binge drinking (5+ drinks in a row). In the same time period, 7% of students reported driving after drinking, 22% reported smoking marijuana, and 15% reported driving after using marijuana. Clearly, these conversations are an important part of helping to keep our kids safe and supporting them make healthy decisions. Even if it may seem like teens are not listening, research show that children of all ages are deeply influenced about their parents’ opinions and values. The ParentUP Vermont website provides useful support to help parents make a plan for talking to their teen and find resources to get help for your teen if you think they might be using already. The website is easy to navigate and tailored to the needs of Vermont families! Do you know when is a good time to talk with your kids about marijuana? Express Care. Make Connection. Educate. Set Boundaries. Role model. There has been conflicting talk in our media lately related to marijuana policy and increasing access to marijuana for recreational use in Vermont. Between legalization, increased normalization in pop culture and new ways of using (edibles, vaporizers, concentrates), it’s becoming more and more complicated to know how to address marijuana use with kids. These are highly complex issues and it is important to be informed and thoughtful about the impact of marijuana use on individual and community behavior. What we know from research is the marijuana use has ill effects on health and should be discouraged, particularly by youth. Similarly to tobacco and alcohol, the more prevalent and accessible marijuana is to youth, the more likely they will be to engage in substance use. Parents, educators, and school counselors have a powerful opportunity to influence and support students who may be taking this type of risk; it can begin with keen observations and consistent work to form trusting relationships. Think back to your own role models growing up. They might have been parents, teachers, neighbors. Often it is difficult to remember the specific lessons they taught or things they said to you, however, it might be easier to think about how they made you feel - connected, capable, and cared for. Research shows there is a strong connection between feeling valued in a community or school and substance abuse. Adolescents who perceive that their teachers and community cares about them are less likely to initiate marijuana use, cigarette smoking, drinking to get drunk, and other health risk behaviors (1). Relationships with parents, teachers and counselors are among the most important and formative ones for many youth. According to studies, students who are poorly bonded to school are also less likely to recognize that substance use may reduce the likelihood of them achieving their future goals. “There has been a lot of misinformation lately going around about marijuana. What have you heard from others about marijuana? I’ve spent some time getting more informed lately so I have more accurate information. Can I tell you what I know?" 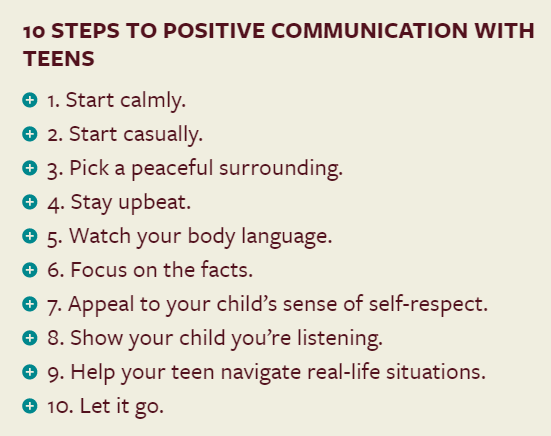 Finding natural ways to talk with kids about drugs and alcohol can be challenging. Especially with teens who may seem like they’re not listening—or don’t care what you have to say. But the truth is, children care deeply about their parents’ opinions, even if they don’t show it directly. In fact, the #1 reason kids give for not drinking is that they don’t want to disappoint their parents. Learn more about these strategies, watch helpful videos, and read how to take action by visiting http://parentupvt.org.